JDS supremo H D Deve Gowda hinted that the Opposition is mulling Andhra Pradesh Chief Minister N Chandrababu Naidu as its probable Prime Ministerial candidate. Amravati: Dropping hints that Andhra Pradesh Chief Minister N Chandrababu Naidu could possibly be the opposition choice for the Prime Minister’s post to replace Narendra Modi, JDS supremo H D Deve Gowda Monday said the country was looking towards the TDP president’s leadership. When the country was at such a critical juncture, Naidu has “accepted the challenge” and “why cannot he become the PM of the country,” Deve Gowda asked. The JD (S) leader addressed two election rallies at Tiruvuru and Pamarru in Krishna district this evening in support of the Telugu Desam Party for the April 11 general elections in the country. Stalin, incidentally, had proposed Gandhi as the Prime Ministerial candidate of the opposition alliance at a function in Chennai in December last year where Karunanidhi’s statue was unveiled. However, the proposal had drawn a lukewarm response from several other opposition leaders who were not keen on naming prime ministerial candidate before the polls itself. Noting that the country was today facing several challenges as “all democratic institutions have been demolished,” Deve Gowda said a debate has been going on in the media on who could challenge Modi. “Who is going to challenge Modi is an issue. That has been going on in the media. Naidu is the person taking up the challenge saying “I am only the person, I can challenge,” Gowda said. “Naidu has taken the lead to fight MModi’sundemocratic ways of destroying democratic institutions,” he said. At the same time, Deve Gowda observed that there were several leaders who could challenge Modi. Referring to Modi’s criticism of opposition alliances, Deve Gowda asserted that coalition governments also could give sufficient progress, so far as development was concerned. “Every state has provided such strong leadership. In the south ,there is Chandrababu Naidu, West Bengal Mamata Banerjee, UP Mayawati, Akhilesh Yadav..Like this ,all the regional leaders have come together to give an alternative force meant to challenge Narendra Modi… Modi says stability of such groupings is a question mark but credit should go to Chandrababu Naidu for uniting all such leaders to challenge Modi,” Deve Gowda said. “What was the situation in Jammu and Kashmir then? For 10 years, no PM went there. I visited five times and brought peace. We conducted an election, invited Farooq Abdullah. Brought him back from London. Election was held, a clear majority was given to National Conference at that time,” he said. “I took seven days to go and study the situation. Naga people were fighting. Two Naga leaders were in Geneva. I personally met them and persuaded them for a ceasefire. Asked them to come back to India but they came to Myanmar. We tried to negotiate and bring peace. I can give several such instances,” the former PM added. He also said the women reservation Bill was moved in Parliament during his tenure. 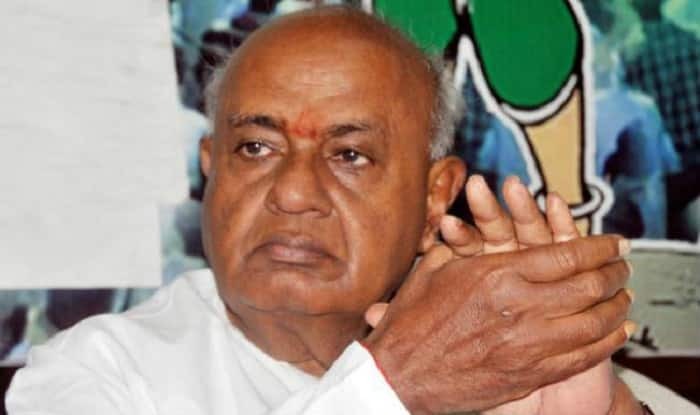 “But what has happened, nothing has happened,” Deve Gowda lamented.